Tasty Twigs are tasty baked sticks that your furry little buddy will love. Great for hamsters, gerbils, rabbits, mice, pet rats, and other small animals. 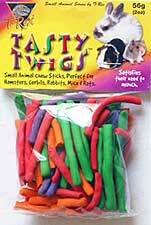 Tasty Twigs satisfy your pet's need to nibble. For use as a supplement to a well rounded diet. TR 60240 Tasty Twigs 2 oz. TR 60242 Tasty Twigs 4 oz. TR 60244 Tasty Twigs 32 oz.